Making threats against Israel, is not exactly good foreign policy for the U.S. as it puts America directly in opposition to Almighty God according to Genesis 12:3. As we almost certainly know, Obama, is a Muslim and his distaste for Israel, while constantly supporting Israel's enemies continues. -W.E. In its public posturing, the Obama White House may be playing it rather cool and calm in reaction to news that House Speaker John Boehner — without consulting or notifying 1600 Pennsylvania Avenue — invited Israeli Prime Minister Benjamin Netanyahu to address Congress. An Obama spokesman says the move is a “departure” from protocol, and neither the president nor vice president will meet with Netanyahu. But privately, say inside sources, the administration is fuming over the Israeli leader’s plans to go before U.S. lawmakers in March regarding the possibility of stepping up sanctions against Iran. In fact, one unnamed Obama official has reportedly threatened retaliation, saying Netanyahu will pay “a price” if he dares to appeal directly to the senators and representatives. 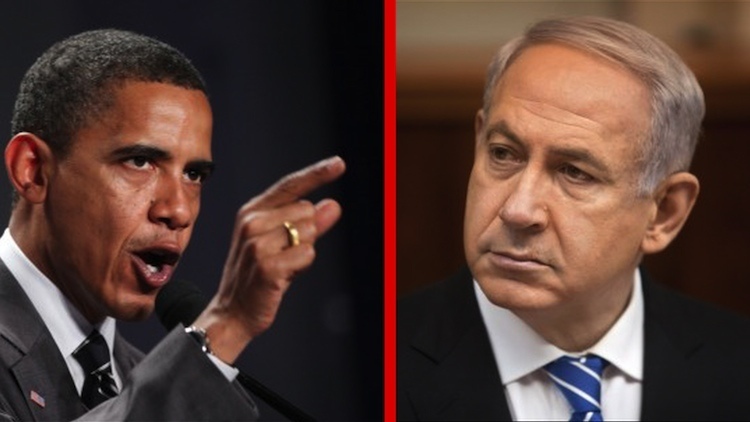 Fox News reports on accounts in the Israeli media saying that the White House is outraged by the Israeli prime minister’s acceptance of Boehner’s speaking invitation, and that Obama intends to inflict payback. “We thought we’ve seen everything,” a source identified as a senior American official was quoted as saying. “But Bibi [Netanyahu] managed to surprise even us. There are things you simply don’t do. In addition, the Fox News report says that President Obama has even gone so far as to directly warn Netanyahu not to get involved with the back-and-forth between the White House and the Congress over sanctions against an Iranian regime thought to be seeking development of its own nuclear weapons. The new Republican majorities on Capitol Hill have been considering harsher sanctions to put more pressure on Iran to back off its nuclear ambitions. Of course it’s possible the testiness of the Obama team with its reported “pay a price” Netanyahu threat could be the partial result of extraordinary criticism of the president’s “crumbling” foreign policy — blunt criticism coming from the editorial board of the left-leaning Washington Post. The Post’s editorial of January 22nd blasted Obama’s so-called “partnering” strategy with nations where anti-American terrorists have sought safe havens, especially in Middle East countries such as Yemen, which has fallen into chaos. The Yemen mess reveals the weaknesses of Mr. Obama’s “partners” strategy…. Unfortunately, the president’s cursory and formulaic description of his counterterrorism policies this week, following a year in which jihadist forces and terrorist attacks expanded across the world, suggested that he remains uninterested in correcting his mistakes.